This is a cocktail that tastes very moreish but is lethal if you take too many of them! So handle with care! It must be downed in one to enjoy the flavour which is tastes like mint, orange chocolate. That said, it looks very pretty and is great to serve if having say an Irish night or for an Irish celebration like St. Patrick's Day. It looks complicated to get right but all it takes is a little care. 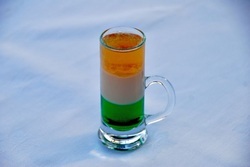 Pour each of the three components slowly and carefully and the drinks won't mix and you will end up with the three colours of the Irish flag in separately and clearly. ~ A glass which is about 3 to 4 inches high and slim. A sherry glass is fine. 1. Line up the three bottles of alcohol and have the tops of the bottles removed so you can work smoothly. 2. Pour in the Creme de Menthe to a third of the glass. 3. Tilt the glass slightly and pour the cream liqueur carefully down the side of the glass to another third level. 4. Keep the glass tilted slightly and add the Grand Marnier for the final third of the glass. 5. Brace yourself ... and ...DOWN IN ONE!